O. carriboea is known, with certainty, only from small juveniles. Like most (all?) young in this genus, it is found in the neuston of the surface waters, where it is often associated with the floating seaweed, Sargassum. It has a purplish dorsal surface and silvery to golden sides and ventrum. Species characteristics change rapidly with growth. Insufficient information is available to distinguish this species from other species of Onykia when comparing only small juveniles. This is the type species of the genus. The type locality is the Gulf of Mexico and the Gulf Stream. Specimens of subadult Onykia from the Gulf of Mexico appear to be conspecific with O. robsoni (Kubodera, et al., 1998). Therefore, O. robsoni could ultimately prove to be a junior synonym of O. carriboea. However, detailed comparisons of specimens from their respective type localities are needed before this problem can be resolved. The problem is further complicated by the fact that the holotype of O. carriboea no longer exists (Sweeney and Roper, 1998). Lesueur, C.A. 1821. 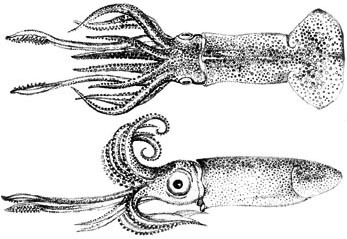 Descriptions of Several New Species of Cuttle-fish. Journal of the Academy of Natural Sciences of Philadelphia, 2(1):86-101.